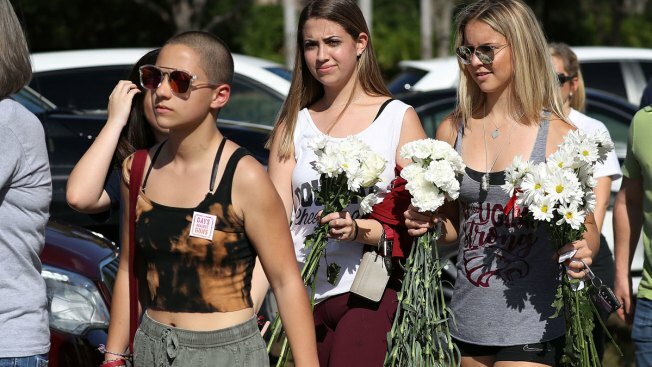 Emma Gonzalez (L), a senior at Marjory Stoneman Douglas High School, and others walk to campus on February 25, 2018 in Parkland, Florida. When students return to school on April 2 they will be given clear backpacks. When Marjory Stoneman Douglas High School students return from spring break, they'll be required by the local school district to use clear backpacks and wear identification badges at all times. Broward Schools Superintendent Robert Runcie told parents in a two-page letter about the security changes. It said the backpacks will be given to students at no cost when they return to school on April 2. He also noted that metal detectors may soon be installed at the school in Parkland, Florida, where a teenager who carried an assault weapon in a large bag killed 17 people on Valentine's Day.